Because of an untimely illness I was unable to board and ended up missing my flight to Abu Dhabi. I was very fortunate to receive amazing customer support from OneWorld alliance partners. Originally, I was booked to fly Etihad from Bangkok to Abu Dhabi (spend a few days) then Abu Dhabi to Washington DC. The customer service gods stepped up big time and re-routed me on Japan Airlines (JAL) for Bangkok to Tokyo (airport change) to NYC (airport change) to Washington DC (BKK-HND-NRT-JFK-LGA-DCA for the IATA heads out there). Not a great itinerary. When my ticketing email came through I found out I had been booked Bangkok to Hong Kong to Chicago to Washington DC… in first class on Cathay Pacific!!!! Cathay F is generally regarded to be the second best first class product available. I was excited to give it a shot. I had a long itinerary. I left Bangkok at 2am and didn’t leave Hong Kong until 1pm the next day (it’s only a two hour flight to Hong Kong). I stopped by The Wing first class lounge in Hong Kong. This lounge features 5 cabanas (private rooms with beds, bathrooms and showers) but I made the mistake of going for a beer instead of snagging one up right away. I was still able to shower but I was desperate for sleep. Cathay offers 6 first class seats on their transpacific flights so I was looking forward to the 15 hours between HKG and ORD. Our flight was delayed an hour because of passengers delayed on a flight from mainland China. We were offered champagne and wine while we waited. I requested an early meal service so I could go to sleep asap. My flight attendants were awesome and kept me about half a course ahead of my first class compatriots. 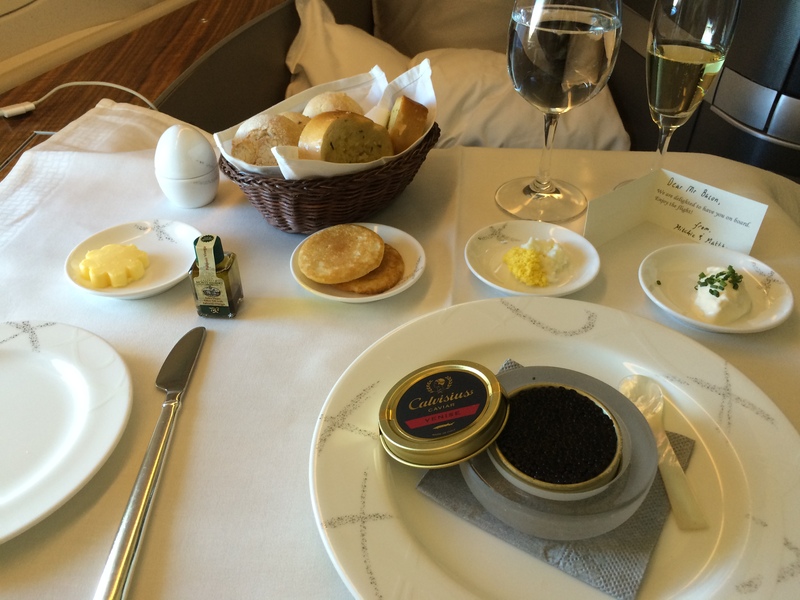 The meal opened with champagne and caviar. It was my first time eating caviar and I absolutely crushed my little tin. Loved the stuff. This was followed by seared scallops, yellowfin tuna steaks, ribeye with bernaise and finished with fresh fruits and cream. My stomach was still on the rise so I went with the “international” (aka western) menu. Ice cream, cheeseburgers and noodles were available as long as supplies lasted and breakfast was available at anytime up until one hour before landing. Toast was served with mini glass jars of jam and honey (I crushed 8 pieces watching an episode of Louie). I also ordered organic scrambled eggs, canadian bacon, and a lightly spiced sausage (pork always needs more fennel). The six of us in first class had two lavatories available for us and the pilots to use. Some passengers chose to change into the pajamas provided but I opted to save mine for another day. 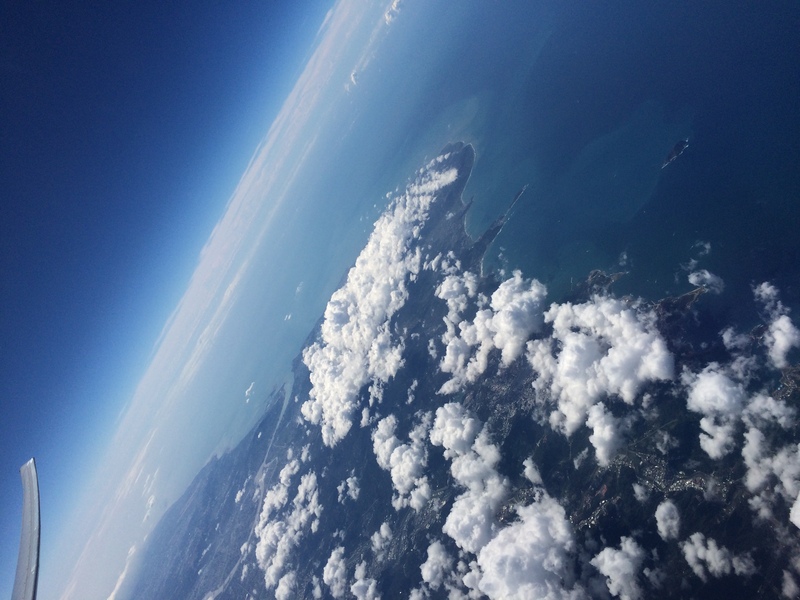 There won’t be many more first class flights in my future so I relished the experience. It was a relief to be back in the US after almost 30 hours of traveling. I can’t wait to be back to Asia and hope to fly Cathay the next time I go! ← Cathay Pacific Business Class or BUST!